The 2017 ISG Annual Scientific Meeting took place once again at the Melbourne airport, on 5 & 6 February. One of the highlights of this year’s meeting were presentations by international speakers Dr Dan Jernigan and Dr Jacqui Katz from the USCDC. Dr Kanta Subbarao, the new Director of Melbourne’s WHO Collaboration Centre, also presented. The Australian Influenza Vaccine Committee (AIVC) has made its recommendations for the composition of influenza vaccine for Australia in 2017. B: a B/Phuket/3073/2013 like virus. The AIVC recommendation introduces a new A (H1N1)pdm09 like virus strain when compared to the composition of the TIV and QIV in 2016. On 22nd June 2016, Dr Alan Hampson stepped down from the Chair of the Immunisation Coalition (formerly known as the Influenza Specialist Group). The Influenza Specialist Group had its beginnings in 1990 due to an unexpected demand for influenza vaccine in Australia. At the time, use of influenza vaccine in Australia was very low - around 500,000 doses year (compared to over 7.5million doses today). The 65 and over population alone of around 1.9 million, but the general public were very much unaware of severity of influenza. In fact, doctors were not recommending vaccination against influenza, because they did not see influenza as important, nor did they believe that the vaccine was effective. In addition, there was no promotion or advertising about influenza vaccination. This is where Alan Hampson led the charge. With a small cadre of like minded individuals he began raising awareness of influenza. His efforts grew each year, with the Influenza Specialist Group being established as a not for profit organisation in 2006, and has gone from strength to strength under his guiding hand. At the ISG’s 2016 annual general meeting, it was agreed to change the name from Influenza Specialist Group to Immunisation Coalition, in recognition of the organisation’s move into a broader vaccine preventable diseases arena. The organization clearly would not be what it is today without the tireless work and the leadership of Alan Hampson. A virologist with over 40 years experience working with influenza, Alan’s career includes responsibility for developing influenza vaccine production processes with the Australian biopharmaceutical group CSL Limited, and subsequently as Deputy Director and operational head of the WHO Collaborating Centre for Reference and Research on Influenza, Melbourne, from its designation in 1992 until his retirement in September 2005. 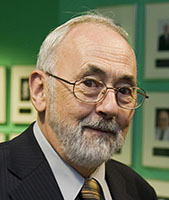 Alan has received numerous awards and recognition for his contribution to public health, including: recipient of the Asia Pacific Society for Medical Virology Excellence Award (2006); an Honorary Doctorate of Medicine from the University of Melbourne (2006); the Order of Australia Medal for his contributions to public health, particularly with respect to influenza (2007); and was made a Fellow of the Australian Society for Microbiology (FASM) in (2007). He has now handed over the reins to Professor Paul Van Buynder, who will lead the Immunisation Coalition into a new era. Alan will remain a Director for the time being, and will continue to chair the Influenza Specialist Group, which is now a special interest group of the Immunisation Coalition. The ISG started a process of metamorphosis more than two years ago with an objective to build on its reputation and experience as a not-for-profit advocacy group to fight vaccine hesitancy on a broader scale. Based on an in-depth consultation process for strategic change that included members and stakeholders, the ISG Board of Directors put a proposal to its members at the 2016 AGM to change the organisation’s name from the Influenza Specialist Group to the Immunisation Coalition. ASIC formally approved the change of name on 29th February 2016. Over the years the ISG has become a very strong brand name in relation to advocacy for influenza prevention and treatment. The ISG will continue as a brand in the form of a special interest group within the Immunisation Coalition. The influenza meeting that takes place at the beginning of each year will still be known as the ISG’s annual scientific meeting. The Immunisation Coalition will become a broader based organisation that encompasses a range of vaccine preventable diseases with an aim to reduce/change vaccine hesitancy amongst Australians. The Immunisation Coalition will improve the protection of all Australians against infectious diseases by advocacy for immunisation. To create public awareness regarding the importance of immunisation by providing educational materials and communication programs. To co-operate with key Australian professional bodies, consumer advocacy groups and the Australian, State and Territory Governments in their educational activities focused on immunisation to bring information to Australian healthcare professionals and the public. To work with consumers, health professionals and organisations with an interest in immunisation, ensuring that the information provided to consumers through our website and other communication channels is current, easily understood and scientifically informed. In addition to influenza, the Immunisation Coalition will encompass pneumococcal disease, pertussis and zoster in its initial advocacy portfolio, and will continue to work with key Australian professional and consumer groups, and the Australian Federal, State and Territory Departments of Health. The Immunisation Coalition will be launched officially in Brisbane on June 10th 2016 at its inaugural adult vaccination forum, following the PHAA communicable diseases meeting. The World Health Organisation (WHO) has just announced its recommended formulation for influenza vaccines to be used in the Northern Hemisphere winter 2016-17. The periodic replacement of virus strains contained in influenza vaccine is necessary because of the constant evolution of influenza viruses, which can change their antigenic and genetic characteristics. The WHO recommendation on the composition of influenza virus vaccines for use in the northern hemisphere 2016-2017 was announced in a WHO Information Meeting and Round-table Discussion with manufacturers and regulatory agencies; following a 3-day WHO Consultation with Advisers from WHO CCs and WHO ERLs based on year-round surveillance by the WHO Global Influenza Surveillance and Response System (GISRS). The formulation of influenza vaccines for use in Australia is determined each year by the Australian Influenza Vaccine Committee (AIVC) based on information and recommendations from the World Health Organization (WHO). (Find out about the process here). ISG Media Alert: Media release Beat the flu and have a flu shot now! While influenza cases are on the rise, it is not too late to get vaccinated. As the number of influenza cases start to rise and amid indications that Australia is facing another particularly severe flu season, a new ISG survey shows that many Australians remain unprotected because of the late availability of vaccine this year and difficulty in arranging vaccination. The latest ISG survey shows that 1 in 5 people who had intended to get a flu shot this year are currently still unprotected. 33% of them stated they could either not get a suitable GP appointment or the vaccine was not available at their GP. The national AusVaxSafety vaccine safety surveillance system announces the 2015 seasonal influenza vaccine is safe in children under 5 years of age. AusVaxSafety surveillance is a collaborative initiative led by the National Centre for Immunisation, Research and Surveillance (NCIRS) and involves vaccine safety experts, state and territory public health systems, general practitioners and children’s hospitals across Australia. It is funded by the Australian Government Department of Health. AusVaxSafety uses two computer-based software systems, known as Vaxtracker and SmartVax, which send SMSs or web-based surveys to parents and carers seeking information on how their child felt after receiving the influenza vaccine. Educational Webinar: All you need to know about the 2015 Flu Shot! For GPs, nurses, and immunisation providers. Australia’s leading influenza expert body is urging Australians to “book a flu shot now”, with influenza cases already at significantly higher levels recorded than this time last year. The government-funded flu vaccine for at-risk groups will be made available by April 20, a month later than usual, due to manufacturing delays with incorporating two new strains into the vaccine. The Influenza Specialist Group (ISG) is warning the late start to the flu vaccination season is leaving Australians with close to six weeks to get vaccinated before winter. According to Dr Alan Hampson, Chairman of the ISG, the most recent serious influenza cases in the Northern hemisphere were caused by the A(H3N2) virus, which emerged as the predominant, circulating strain during the five-to-six month vaccine manufacturing period. This virus type, which has historically been associated with increased severity among the elderly, has also severely impacted all age groups. “The 2015 Southern Hemisphere free flu vaccine contains two new strains, including the H3N2 influenza strain, which has been responsible for a severe flu season and high flu hospitalisation rates in the Northern Hemisphere, and the late outbreaks of influenza B in Europe. Down load full media release here. 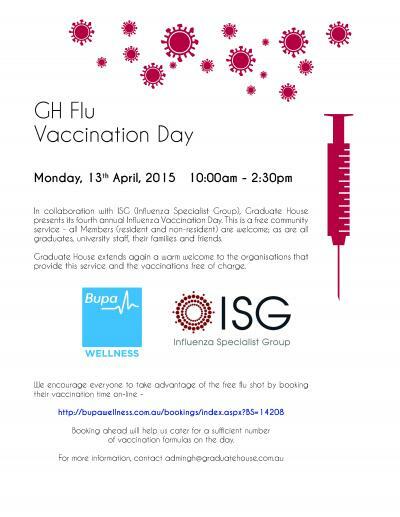 Our Annual Free Flu Vaccination event is on again at Graduate House in Melbourne. The Department of Health recently advised that the National Seasonal Influenza Immunisation Program for 2015 would not commence on the usual date of 15 March, but would instead commence on 20 April of this year. The main reason for the delay was the due to two strain changes from the 2014 vaccine. However, there has been some confusion regarding the reasons for the delayed availability of influenza vaccine in Australia this year. For example, the suggestion that vaccine had been made from ‘old strains’ and in view of the less than ideal protection seen in the Northern Hemisphere winter had to be replaced and the process started again. The formulation for the current year’s Australian vaccine was actually determined early in October 2014 and manufacture commenced shortly afterwards, prior to any shortcomings of the Northern Hemisphere vaccine becoming known. 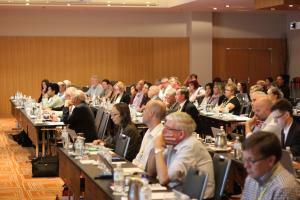 Our annual scientific meeting in Melbourne was an enormous success. Read more. The Australian Government, Department of Health has announced earlier this month, that 'the National Seasonal Influenza Immunisation Program for 2015 will not commence on the usual start date of 15 March. The main reason for the delay is that 2015 southern hemisphere seasonal influenza vaccine will contain updated strains for two of the three vaccine components compared with the 2014 vaccine. The ISG will update the information accordingly over the next few weeks. Winner of the 2015 ISG Travel Scholarship is announced. The ISG congratulates Ms Anita Smith on winning the 2015 ISG travel scholarship. The scholarship is available to applicants (students with a demonstrable interest in influenza/respiratory vaccine preventable infectious diseases) studying an undergraduate or postgraduate medical degree at an Australian University. Anita completed her bachelor of Pharmacy in NZ, followed by a Graduate Diploma in Pharmacy Practice at Monash University. She also holds a John Flynn Placement Program Scholarship, and is doing her MBBS at the University of Notre Dame in WA. She plans to share the knowledge gained at the ASM with fellow students via a presentation at her university, and to increase awareness of the importance of influenza generally. Having worked clinically with influenza vaccinations, she would like to observe the debates on influenza issues, to get a better understanding of the bigger picture from a public health perspective. In the future, she aims to complete an internship with WHO working with their Immunization, Vaccines and Biologicals department. 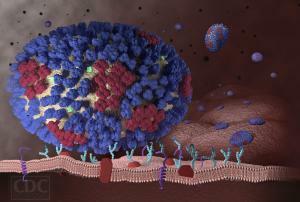 ISG Media Alert: Flu is here: With numbers climbing, Mum’s are hit the hardest! With more than 20,979 laboratory confirmed cases in the country, Australia is experiencing double the number of cases than at the same time last year. ISG Media Alert: Despite long-­‐standing recommendations, the uptake of influenza vaccination in Australian children with high-­‐risk medical conditions is low – new study. Australian children with high risk medical conditions are not being sufficiently vaccinated against influenza. A new study has revealed that more than half (59%) of children with high risk conditions, and 86% with standard risk conditions are not being vaccinated. 1 Children with high risk medical conditions, including severe respiratory disease, diabetes, cancer and other conditions which impair immunity, are prone to severe influenza infection. Many high risk children in Australia remain unvaccinated against influenza despite long-­‐standing recommendations for its use in this group. 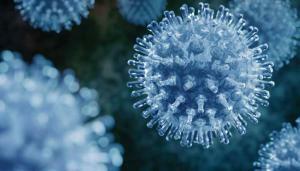 ISG Media Alert: This year’s flu can hit the fit young and healthy! It was just a normal Friday evening earlier this year, when 40 year old gold coast resident, Gai O’Dwyer began experiencing severe headaches and body cramps. Over the week-end her symptoms worsened and she felt really sick. So she went to see her GP who suspected a case of influenza and did a nasal swab test. The diagnosis was confirmed a few days later by the laboratory results, which specified the virus as Influenza A. What followed was an extremely difficult six weeks for Gai and her family. Her husband had to take two weeks off work to care for her and their young daughter while she recovered. A new study has revealed that less than 40% of pregnant Australian women are being vaccinated against the flu. Pregnant women have an increased risk of influenza complications and scientific evidence suggests that the influenza vaccine is both safe and effective during pregnancy. The study, undertaken by BMC Family Practice, aimed to investigate the attitudes, beliefs and practices of General Practitioners in relation to influenza vaccines and pregnancy. Remarkably, one-third of General Practitioners did not think that influenza during pregnancy was a serious risk for mother and infant. ISG Media Alert: Although winter is here, it’s not too late to get a flu shot! Experts warn: DON’T SOLDIER ON IF YOU HAVE THE FLU! A recent study has revealed that two in three Aussie workers incorrectly believe that antibiotics are effective in treating the flu. The study, published by NPS MedicineWise, has revealed a lack of understanding around the severity of influenza and the need for education around prevention and treatment. In short, antibiotics only work for bacterial infections, whereas influenza is due to a virus and requires prescription antivirals administered early to treat the infection. Many popular over-the-counter cold and flu medications can provide relief from some symptoms of flu, yet they have no affect on the virus itself. The study also revealed that as many as 94% of Australian workers have gone to work with the flu. 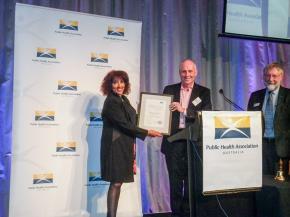 Congratulations to ISG Director Professor Raina MacIntyre for recieving the National Immunisation Achivement Award 2014. 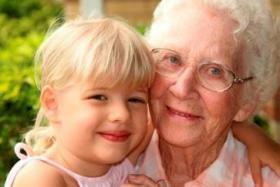 Equity in Disease Prevention: Vaccines for the elderly. Featuring Max Walker AM, former Australian test cricketer as Keynote Speaker who will speak about the importance of healthy ageing in society. "We live in an ageing society, where positive ageing and prevention are key to a healthy future. Vaccines can prevent disease, suffering and death. The elderly are at increased risks of vaccine preventable diseases such as influenza, pneumococcal disease, herpes zoster and pertussis. Immunisation is an effective and available strategy for reducing disease burden in the elderly, yet vaccines for the elderly are under-utilised and under-valued compared to children." This workshop will feature international and national speakers on aging and vaccinology (pneumococcal disease, quadrivalent influenza vaccine, herpes zoster and pertussis), including Professor David Goldblatt, University College London who will speak on the future of pneumococcal vaccines for the elderly. The workshop will provide an update on the latest evidence around immunisation for the elderly, and will address barriers for prevention of infection in the elderly. "Are people with chronic kidney disease at increased risk? The answer is yes, they are at increased risk of becoming seriously ill, being hospitalised and even dying if they contract influenza. There are a number of reasons for this." Influenza: Time to vaccinate. But who and why? "Influenza vaccination should be recommended not only to all patients who qualify for the government-funded vaccine but also to those shown to be at increased risk of complications in the 2009-10 influenza pandemic, including the clinically obese and tobacco smokers." “Our study found that immune responses diminish with increasing age and frailty, but that even people with absent immunity at baseline can mount a strong response to vaccines. This is strong evidence that the elderly can be protected by pneumococcal vaccines,” said Professor Raina MacIntyre, the lead author of the study. The winner of the inaugural ISG Annual Scientific Meeting travel scholarship has been announced. The Influenza Specialist Group wishes to congratulate Anthea Katelaris on being awarded the ISG Annual Scientific Meeting travel scholarship for 2014 – the first time such a scholarship has been given. Anthea is a final-year medical student with a passion for public health, influenza and vaccinology, and a demonstrable interest in influenza, having completed a year of research in the field, as well as an internship at the WHO Regional Office for Europe Vaccine-preventable Diseases Unit. The ISG would also like to thank the other scholarship applicants for their submissions, all of which were of a very high standard. The ISG now has its own Facebook page!